Dr. D.J.Ogilvie-Harris has been a Staff orthopedic surgeon since 1982 at Toronto Western Hospital, where he held the job of Chief of Orthopedic Surgery for 10 years. He has held other academic and administrative posts, such as director of the residency program and head of the trauma committee. He spearheaded a fundraising campaign to raise $1,000,000 for a research Professorship in Orthopedic surgery, known as the Smith and Nephew Chair of Orthopedic Research. Subsequently this has become a University Chair with a value of over $2,000,000. Recently in 2012, 2013 he has been an active member of the UHN group that raised $35 million for “A cure for arthritis”. He has been active in research, having published over one hundred scientific papers plus many book chapters. He has lectured widely in North America, Europe, Asia, Australia and the Middle East. His special interest has been sports injuries. He has focused on preventative programs as well as rehabilitation. He was the co-founder along with Dr. Michael Clarfield of the Sports Medicine Specialists – a well recognized center of excellence for sports related diagnosis and treatment. He has particular expertise in arthroscopy and arthroscopic reconstruction. For example, repair of the anterior cruciate ligaments of the knee or rotator cuff tears of the shoulder. He was a pioneer of the use of arthroscopy for smaller joints such as the ankle, elbow and shoulder. His research and clinical publications are mainly in these areas. His current research projects are focused on cartilage regeneration. This may involve preventative training, surgical removal of damaged areas, joint reconstruction and more recently cartilage transplantation and the use of stem cells in early arthritis. Cartilage transplantation is a area of rapidly growing knowledge, with the ability of the surgeon to move healthy cartilage to damaged areas in the same patient. This allows living cartilage from the patient to replace the old damaged areas. He has a major interest in sports medicine. He was team physician for Toronto Maple Leafs Hockey Team for 15 years to 2005. 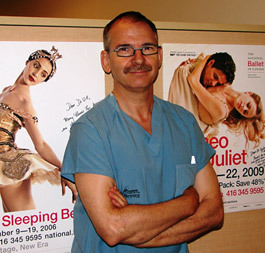 He has looked after the National Ballet of Canada for the past 20 years. He has treated and advised many of Canada’s professional and Olympic athletes as well as ordinary citizens…the weekend warriors. For the past 5 years he has been Program Director of the University of Toronto Sports Medicine Program (UTOSM) based at Womens College Hospital. The goals are to build a leading centre for teaching, research and clinical activity across the University of Toronto teaching hospitals.